In politics, as evidenced by this election, it is always easier to attack your opponent rather than focus on real issues. Oftentimes the media will deflect issues by turning the public’s attention to personal attacks, creating a feeding frenzy of pettiness and divisiveness while ignoring the real issues. This is true in politics and in sports, as this week once again proved. Addressing real issues is uncomfortable. It forces us to face our own humanity, or lack thereof. But we’d rather not face it. For me, the real issue has been and will continue to be domestic violence. I flew to Boston on Election Day to do a piece on a New England Patriot for ESPN’s Sunday NFL Countdown, which didn’t go as planned. After a long day, I came back to my hotel, had a cup of tea (I always travel with my own tea, teacup and saucer) and fell asleep. When I woke up after midnight the first thing I did was look outside of my hotel window in downtown Boston to see if civilization was still standing. It was. I reached for my cellphone, which had decided on its own to update the software. So I waited anxiously to see who had won. Three long minutes later after the update, I saw Donald Trump was winning. By 5 A.M., the next time I awoke, he was the new president-elect. The sentiments on my social media feeds ran from shock to despair. No matter how we feel about the election results, we must remember that the same democracy that elected President Obama to two terms is the same democracy that chose Donald Trump. We can continue to be divisive or we can come together. The big question folks are asking now is: how do we talk to our children about the election results? Simple. We remind our children that they live in the most diverse and resilient nation on earth. We talk to them about personal responsibility accountability. We should also remind our kids that true leadership doesn’t start in the White House. Leadership starts in your house. Impress upon them and exemplify to them the importance of speaking up and taking a stand for what is right, regardless the cost. Remind them that the right thing isn’t always easy. It comes with backlash. It makes people uncomfortable. But do the right thing anyway. Though this election will serve as powerful teaching moment for our children, lessons about personal responsibility and accountability should’ve started long before the election. When your kid starts playing youth football, or any sport for that matter, you teach them the importance of being a good citizen and a good teammate. Parents and coaches inculcate in them to do the right thing—treat people well and help others in need. We push this in youth football, high school football and college, but when they get into the pros, we say: do what's convenient for the team. So everything we've taught our kids about basic humanity, we now feel comfortable telling them to throw out of the window because the stakes are higher and there's money involved. There is no amount of zeros on a check or a position of power created on this planet worth sitting on the sidelines of humanity. Last Sunday was a win for the New York Giants over the Philadelphia Eagles, and Black Eli faced another learning experience in his rookie process. Like any NFL rookie, you’ll have games where you don’t have your best performance. Eli is a strong young man. He’ll do all the necessary things to adjust and get better. That’s what he’s done since he first picked up a football at age 11. Getting better each game has always been his mission. He’s a lot tougher than people give him credit for because he’s not a rah-rah guy. Black Eli leads with quiet strength and patience. He’s not concerned what others think of him. He lives to be true to himself and to make his family proud. My son is one of the best people I know and literally my best friend. For us, it has always been more important for Black Eli to be a good man not just a good football player. When he was in high school, it was important to us that he volunteered. For two summers, Eli volunteered at a local pediatric center that housed infants and kids with extreme physical and medical issues. We’d go to pick him up few minutes early and watch him play with kids whose physical conditions would break your heart. Eli would just play with them and talk with them as he would anyone else. Staff and kids didn’t even know he played football until his name started appearing in the papers. When one of the older kids in the facility found out Eli played football, he started calling him Eli Manning. True story. We’ve never wanted a game to be the identity of Eli’s life or define him as a man. People are so quick to put football players in a box and tell them who they are and how far they can go. We always taught our kids that their identity is rooted in who God created and destined them to be, and to never let anyone define you. There are a lot of good football players, but there are not a lot of good men. There's an expiration date to being a good football player. There's never an expiration date on being a good man. 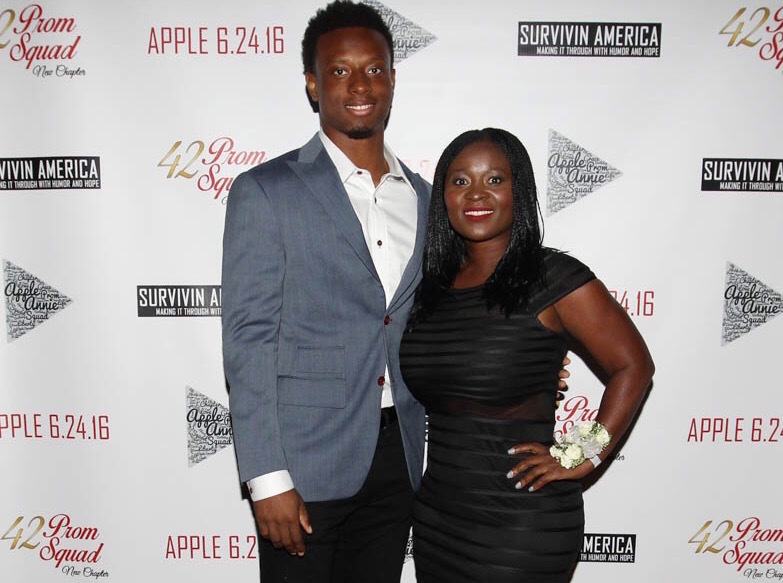 I am the woman I am partly because of Eli Apple. While pregnant with him, I got the courage and fortitude to leave an abusive relationship that had me trapped and broken. He was my courage to freedom. I wanted to be more for him and his brothers. I continue to admire his strength, poise and kindness. I remain proud of him every day. Life is a process. Today I stand eternally grateful to God not just for the mountaintop experiences but for the valley ones as well. I've learned and continue to learn that success is peace and contentment in the person God created you to be. The same faith and courage it took for me to leave an abusive relationship and take care of three young kids at age 20 is the same courage and faith that propels me to stand up for the often voiceless victims and survivors of domestic violence. This is the real issue. Whether in politics or sports, it’s up to us what kind of America we want to create. Our country is the most resilient nation in the world. Some days it’s hard to see but there are amazing Americans doing great things. Every day men and women are out here making great changes and propelling our country to a positive and productive place. Let’s support them. When it comes to doing the right thing in life, you don't need an extensive resume. You don't need balls. All you need is heart.